Childbirth was a magical and religious act for ancient cultures of the Mediterranean. Necessary for life, but also dangerous, it was a time in women’s lives that required the intervention of the divine. 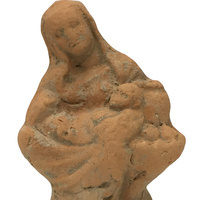 Sculpted in stone, clay, and metal, the female figures on display in this exhibit provided a connection between mortals’ hopes for children and the goddesses that could provide them. Many of the figures represent well-known characters from classical mythology. It was these myths that inspired Americans in the 19th century to travel to the Mediterranean and collect antiquities, ultimately forming the very collections on display in museums today. This exhibit is presented in conjunction with the exhibition “Frederic Church: A Painter’s Pilgrimage” at the Reynolda House Museum of American Art. Admission is free.